The regular feature What I’ve Learned in Frame magazine opens the door for readers to discover more about their favourite designers and architects. In candid interviews, these individuals reflect on the path their careers have taken them and the industry at large, offering the reader the possibility to take a shortcut and learn from their experiences. Revisiting a selection of these interviews for compilation into this new book, What I’ve Learned includes new material and further insights. The book also features the most important projects or products with which these established creatives made their name, but in a personal way, with the intricacies of real-life woven in. 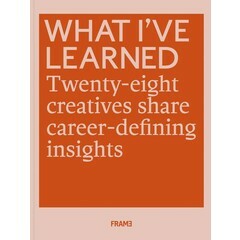 The creative conversations illustrated in this title demonstrate the strengths and inspirational vision of personalities such as Tadao Ando, Jaime Hayon, Hella Jongerius, Daniel Libeskind, Bernard Tschumi and Patricia Urquiola. • What I’ve Learned is based on the eponymous section in Frame magazine. • Established designers and architects reflect on their lives, careers and the industry, with their stories presented in the first person. • The book shows not just portraits of the creatives but also an overview of their best work, and the challenges they face. • Featured are personalities such as Tadao Ando, Jaime Hayon, Hella Jongerius, Daniel Libeskind, Bernard Tschumi and Patricia Urquiola.